• A player may also enter if their ELO is below 250, provided that they have participated with that account in any previous tournament organised by TC or WCO. Exception: If a player for any reason does not wish to disclose the account name of an alias, they may alternatively email customercare@stratego.com to request the account be deleted. ii) When is a game considered to be ‘arranged’? iii) What constitutes valid availability? • Each player must propose the three valid STRs in the relevant Private Message thread sent by TC for arranging each game. • Proposed STRs may not all occur on the same day – they must involve at least two separate days. iv) What happens if both players have provided 3 valid STRs, but there are no valid game arrangements? v) What happens if a player does not show up at the arranged time? vi) What happens if a player has a period of absence? vii) What happens if a player cannot make the default time for automatic arrangements? If a player has not provided three valid STRs by Curfew, they will receive a Strike (Rule 8). Fixtures may need to be re-scheduled in a number of circumstances. TC cannot guarantee that fixtures can be re-scheduled, but if proper notice is given it is highly likely that fixtures will be able to be re-scheduled. The earlier the better! • A Minimum of 6 HOURS notice must be provided for a cancellation to take effect. (If the game is scheduled to occur on Thursday 21.00GMT, notice of cancellation must be communicated via the relevant PM thread BEFORE Thursday 15.00GMT). • Any player who cancels a game already arranged must provide three replacement valid STRs (Rule 3 iii) in the relevant PM thread at the time of cancellation. If any of the above conditions are not met then the match will still be considered cancelled, but this player will receive a Strike (Rule 8). TC will then use their judgement to determine whether the game is to be replayed. Note that TC will only compel a replay where they decide that the disconnected player had a clear advantage. If the winning player is unable to provide a screenshot the game must be replayed. Time constraints may also dictate whether the game can be re-played. Players must respect the decision of TC, which is final. 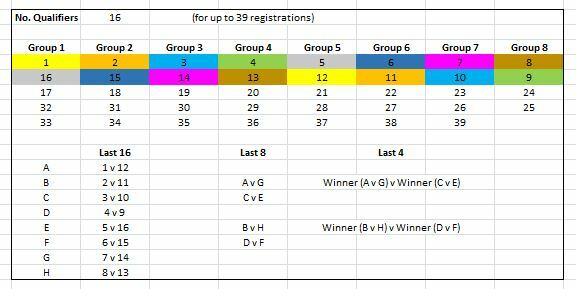 Players 'Seeded by Pool' will be assigned to their group using this website (https://www.randomli...=&qty=8&grp=8). Group matches will be fixtured by TC, in a specific program, so that each player knows who they are due to play in each week. Players may not take it upon themselves to decide to play a particular opponent earlier or later than specified in the published program. 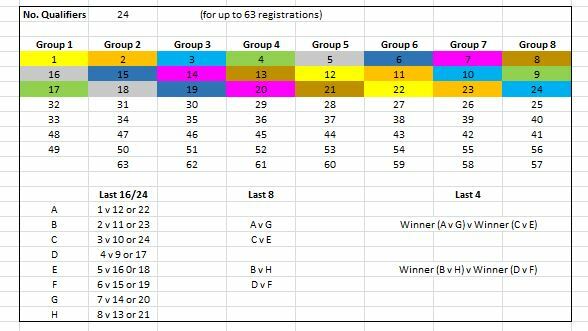 As the Group Stage nears completion, TC reserves the right in rare cases to give specific directions in regards to the order of play, which may result in some fixtures being required to be played before others. • Players earn 6 points for a win, 3 points for a draw, and 1 point for a loss. • Players are awarded 1-6pts for any games against disqualified players that never occurred, which represents the outcomes that could have occurred had the game been played. Please note that in this scenario the time of the re-match must not be later than the cut-off point of Sunday 23.59GMT. Though TC aim to have covered all possible eventualities, in the event that anything unforeseen occurs not covered by the rules (it usually does) the TC will rule on these issues using their best judgement. All decisions made by TC are final. • TC reserves the right to ask any player questions to maintain the integrity of tournaments. Note that this may extend beyond the requirements of the Alias Register (Rule 2). A player who is uncooperative will be subject to disqualification. TC wish you all the best!